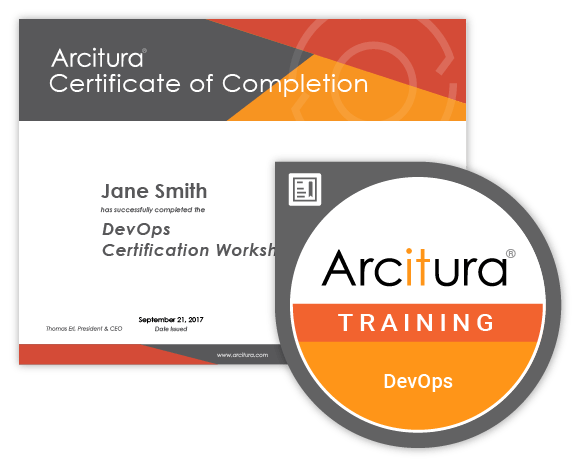 Arcitura Education is pleased to offer the 3-day Virtual DevOps Specialist Certification Workshop. Group discounts are available for two or more registrants from the same organization. As explained below, optional Pearson VUE exam voucher is available as part of this workshop registration. Regardless of whether you pursue the certification exam, by attending this workshop you will receive an official Certificate of Completion that will be mailed to you directly. As an attendees of this workshop, you will receive a printed Certificate of Completion mailed to you subsequent to the workshop. You will also be issued an official Acclaim Digital Training Badge shortly after workshop completion. This workshop includes the optional provisioning of a Pearson VUE voucher for the exam required for the DevOps Specialist certification. The exam is available at Pearson VUE testing centers worldwide, as well as via Pearson VUE online proctoring (see www.pearsonvue.com/arcitura for details). To receive a discounted combined Pearson VUE exam voucher as part of your registration, choose the Discounted Pearson VUE Exam Voucher add-on at the bottom of this page. If you receive a passing grade on the required exam you will become a Certified DevOps Specialist. A Digital Accreditation Certificate will be automatically e-mailed to you and an official Acclaim Digital Certification Badge will be automatically issued to you as well. If you don’t already have an AITCP account, you will be provided an account from where you can access certification logos and your transcript. For more, visit www.arcitura.com/badges. Upon receipt of payment for your workshop registration, you will be offered on-line access to the eLearning study kits that correspond to the courses in the workshop agenda. To view the contents of the eLearning study kits, visit www.arcitura.com/nextgenit/elearning. Please note that eLearning study kits include a number of self-study supplements in addition to the base workshops course materials. The full-color printed course materials for this workshop will be shipped to you as soon as the workshop has been confirmed. If you wish to receive the printed materials sooner, send your request to info@arcitura.com. Please note that the materials provided are those shown in the Taking the Course at a Workshop section of the course descriptions at www.arcitura.com/nextgenit/courses. The additional printed self-study supplements shown in the Taking the Course using a Study Kit section can be ordered by choosing the Additional Self-Study Materials add-on at the bottom of this page. The add-on cost shown includes the additional UPS shipping cost to deliver these additional materials to you. If you do not want to receive printed workshop materials and instead would only like to use the provided eLearning version of the workshop materials, you will be eligible to receive a credit applicable toward future workshop registrations or study kit purchases. Contact info@arcitura.com for details. This workshop will be delivered by a live Certified Trainer via WebEx in Central European Time (CET), as per the schedule below. WebEx access details will be provided separately subsequent to registration. An optional test call can be arranged prior to the workshop to confirm your access. If you would like to cancel your registration prior to receiving access to the eLearning workshop materials, you will be entitled to a full refund of the registration fee. If you cancel subsequent to receiving access to the eLearning workshop materials, you will be entitled to a full credit of the registration fee that can be applied to a future occurrence of the same workshop or you can receive a partial refund equal to the registration fee minus the retail cost of the eLearning materials. This workshop will be confirmed by Arcitura no later than two weeks prior to the workshop start date.